student to confront ethical and moral dilemmas. aware of the national economic, social and cultural context. Currently it has an enrollment of 800 students and 130 teachers. Ciencia, Tecnologia y Sociedad) (Vazquez & Manasero, 1999). M. A. O. RUIZ ET AL. nition plays a central role in conceptual change. process, shown graphically in Figure 1.
the views and attitudes of students on STS issues, was utilized. the Social Sciences) for statistical processing. methodology is quantitative it allows a qualitative analysis too. panel of judges on STS issues (Elfin, Stuart, & Reisch, 1999). Graphic representation of the concept of Me t acogn ition . responses is mostly inadequate (Figure 2). fit the quality of life of society (Figure 3). 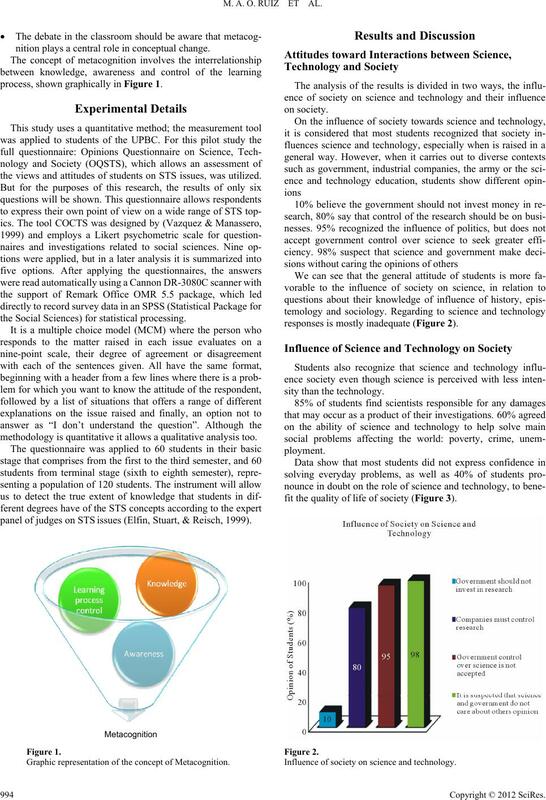 Influence of society on science and technology . Influence of science and technology on societ y.
Porro, Rembado, & Trinidad, 2007). ence and technology works in the world today. abilities and developmental level of students. in science. Science Education, 6 , 109-120.
nature matter. Journal of Science Education, 8, 79-84.
de la sociedad en la ciencia y la tecnología. Arbor, 637, 45-72. (VOSTS). 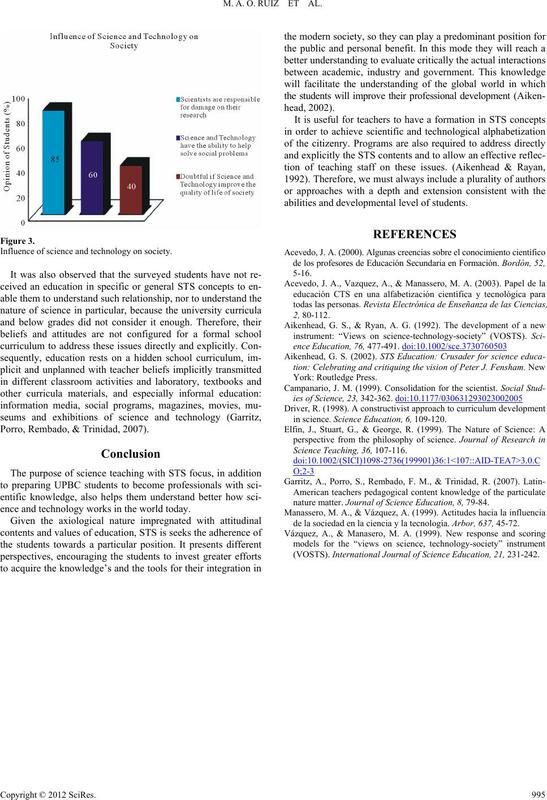 International Journal of Science Education, 21, 231-242.